The Coffee Bean celebrates the 30th Anniversary of their signature Ice Blended drinks this month by offering $1 Original Ice Blendeds on every Thursday in June, from 2 to 6 PM. The deal is only good on small (12 oz.) 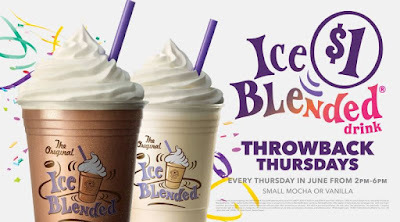 Mocha or Vanilla Ice Blendeds at participating locations on June 1, 2017, June 8, 2017, June 15, 2017, and June 29, 2017. The drinks usually go for $4 or more.